Hey guys. So it's been quite awhile since I have posted on here. Due to real life events, I haven't been able to post as frequently as I use to. Also, due to not playing League as much as I use to, I don't have anything really to post. This website and my facebook page have given me connections to teams and companies that I couldn't have done by just playing. I don't want to take the website down but with the current changes going on in my life, I think it's time to at least change the perspective of the website. I'm going to be changing the home page of the blog to an actual home page. The blog will still be a part of the website, but won't be posted on as much since I still find myself spread thin with my time. I've been playing several games instead of focusing on one, and I find that to be a better way of playing games altogether. Even though I consider myself a professional, I'm not a professional of just one game. Seeking to be the best of one game is a tough challenge, one that I have been struggling with for quite a long time now. So I am going to find a new way of being a professional in the gaming scene. I think this is best for me as a player and you as readers. I also am going to be focusing more on getting reviews out for games that I have been playing. Along with that, I'd like to actually attempt streaming again since I have built a new computer. I hope that it is capable of doing so, if not, I will find another way to visually entertain. Thank you all for sticking with me for this long and I hope you continue to stick with me through the changes. Just overall, the enemy team's picks make absolutely no sense to me. Well, I can 'understand' a few, such as the Yasuo pick. Yasuo right now is a really strong pick overall that is banned quite a lot. So picking him makes the enemy team, if they don't know how to deal with him, tremble in their boots. Also, I can somewhat understand the Malphite pick. Makes some synergy with the Yasuo pick. After that, no clue. From what I could tell, the Poppy has been trolling most of the day. This might of been the reason behind their picks not making any sense. Overall though, we rolled over them this game. Nothing really to boast about. 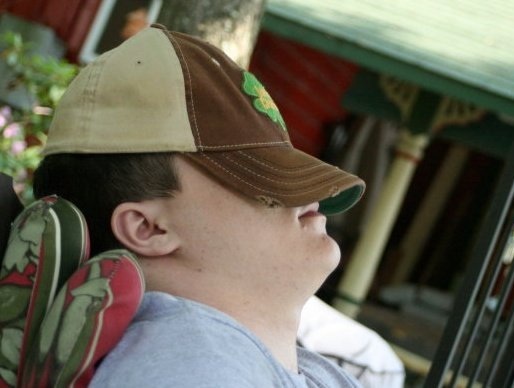 After going on a massive tilt, I took a break. A well needed break from solo queue, which left me at 0 LP in Silver IV. At full risk of dropping down to Silver V. I don't want that... No one wants that. So during my break, I leveled up a smurf (Endelic) to level 14 from around 10ish. Let me practice my mechanics and practice a few champions I didn't know so well. So coming back to ranked with this account (Enaio) wasn't so... 'scary', even though I was at risk of being where I started at the end of last season. As you can see, I pulled through. I feel as if their Ezreal wanted to play ADC instead of mid. Not sure what he was thinking playing him mid. Was able to keep him low during the lane phase and force him to play safe. 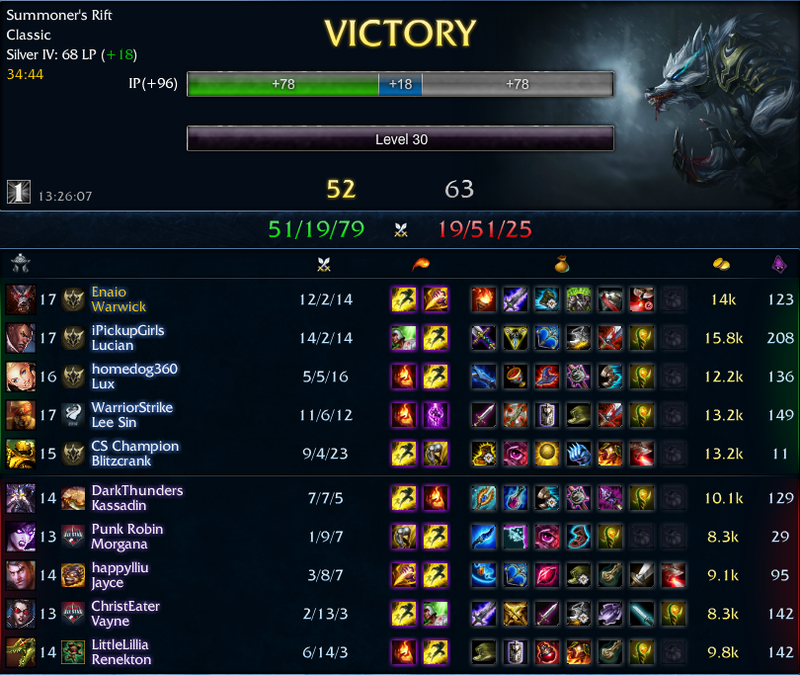 Jarvan attempted to dive him a few times and died but I ended up cleaning him up and getting the buffs back. Still need to climb to where I was but I am happy, even though this has happened twice, that I didn't drop to Silver V.
During my break, my friend Galdanis climbed up to Silver II. This just shows me that if I keep my chin up and don't get frustrated, I can climb this unforgiving ladder. Congrats Gald and I hope to join you soon. Early game, I was very rusty this match up because I haven't played for awhile. 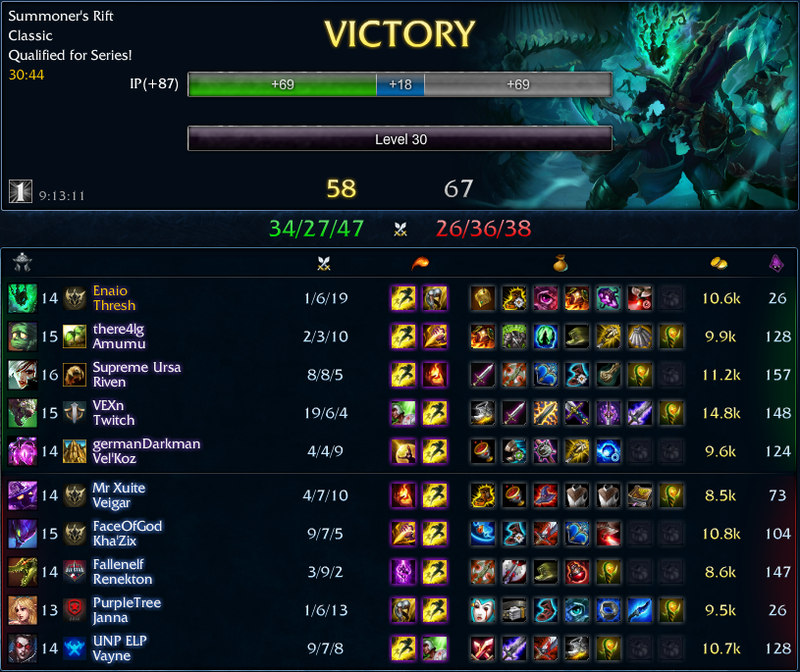 After the first 5 to 10 minutes though, I was starting to get the hang of Thresh again. 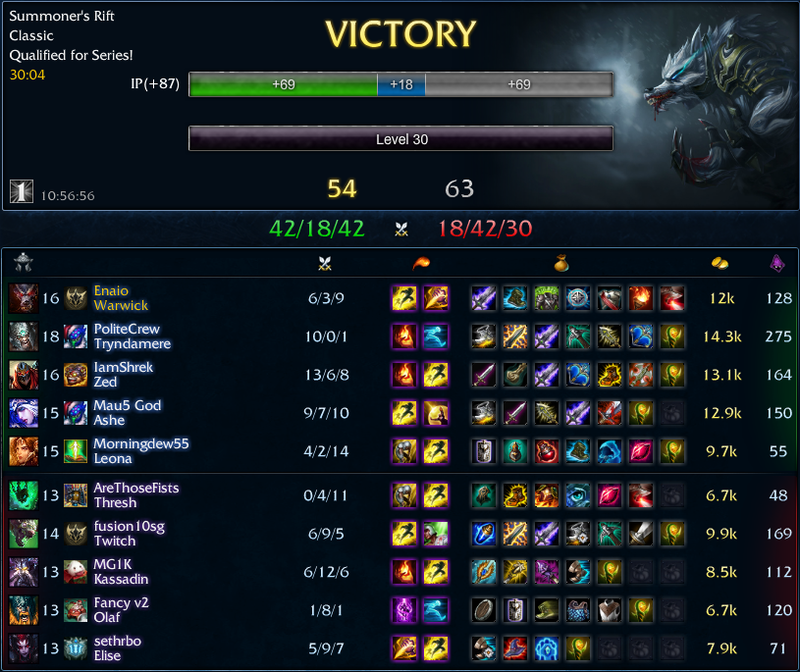 Best moment was when Elise and I went to take dragon but Ashe decided to keep pressuring bot lane. She got knocked up by Jarvan and started coming our way. Landed a hook on Jarvan after he used his ult on Ashe. 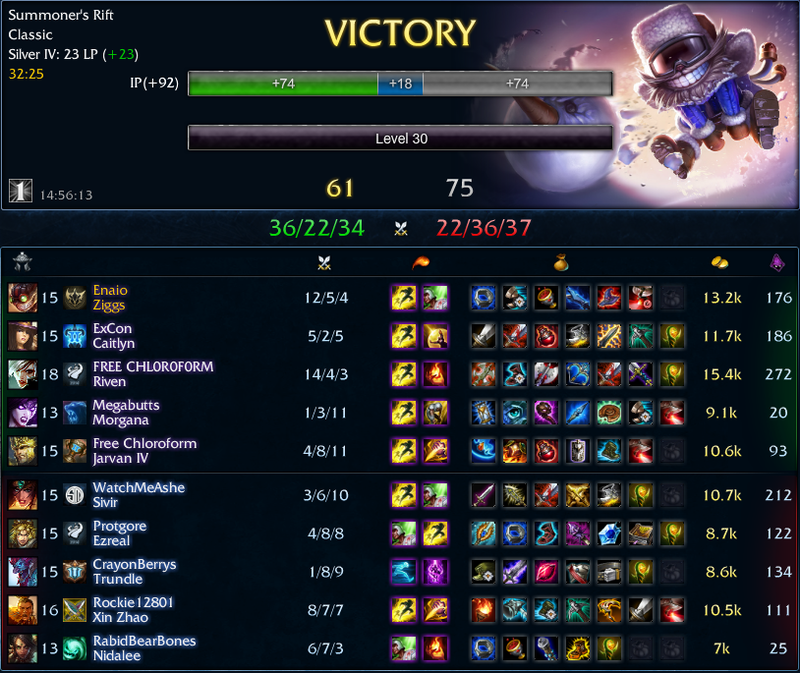 Then chased Cait and Nami to get our Elise a triple kill. Overall though, the game went better then expected. Good game. So close to getting back to where I was before I went on that massive tilt losing spree. 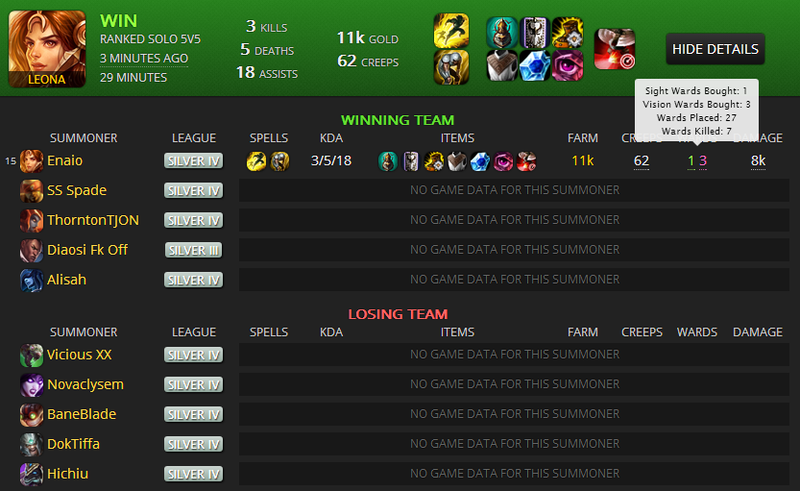 This time around, I went Leona support. Our Lucian was a plat ADC in Season 3 so I had a fairly decent lane partner. At around 10 minutes, Lucian was about to hit 100 CS when Twitch had about 29. Yeah, we shut them out that bad. I had a lot of good Zenith Blades that got us either kills or objectives because the target needed to back. Only issue with this game was the end chat with Morgana. Let's just say, according to him, Twitch was trolling/flaming/raging them and he needed to die in real life. And because I tried to understand why he was so angry, I needed to die as well. Well, I got my win and he got his loss. Maybe if he looks the results, he would realize he isn't the best player in the world and needs to focus on his own game play and mute people like him. I don't know if he was telling the truth or not because there wasn't anything but the end game 'Report (player's name)' comment. Overall, besides the raging at the end, good game. This game was a win only because the other team were arguing amongst each other. Whole game the Olaf was trashing his team in All chat. Like saying the Elise wasn't ganking or the Kassadin was feeding. 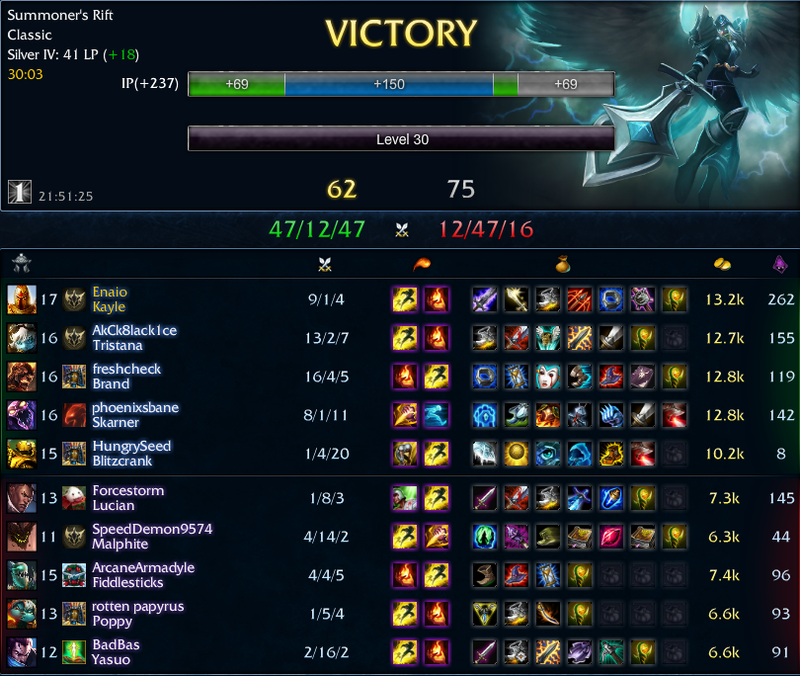 The Kass was bad, but Zed destroyed him in lane. The Elise wasn't horrible but I kept her down by counter jungling as much as a I could (I see a trend going on with my jungling...), which kept her low on levels and cash. Her lack of presence in lanes wasn't her fault because she was bad, but because I was playing smart to keep her from ganking as much as I could. 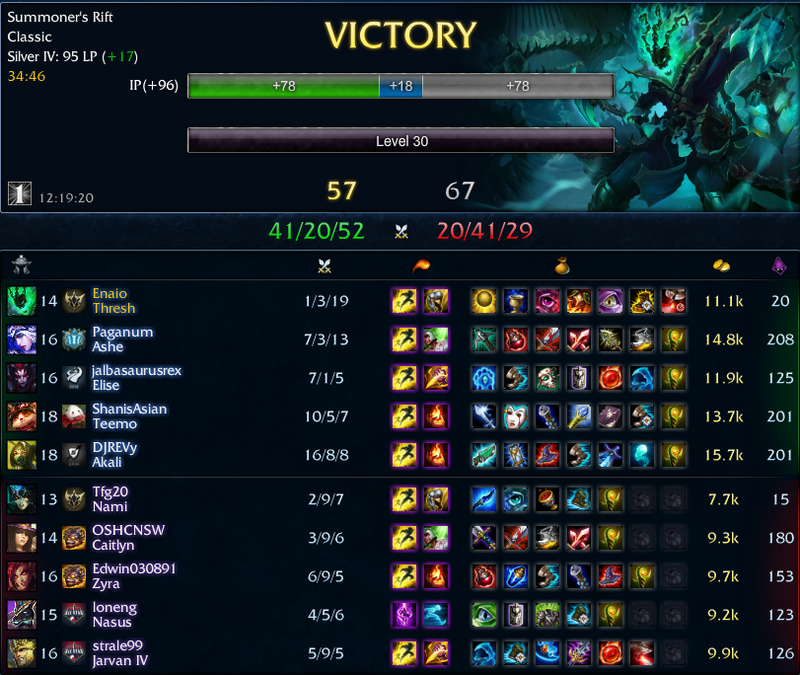 Would have been a good game if the Olaf could learn to keep his fingers from raging in all chat. Your double jungle technique is no match for me! No seriously, just went against a Udyr/Nautalus double jungle team, if you didn't notice in the picture above. Early on, they stole my first red and my second blue. 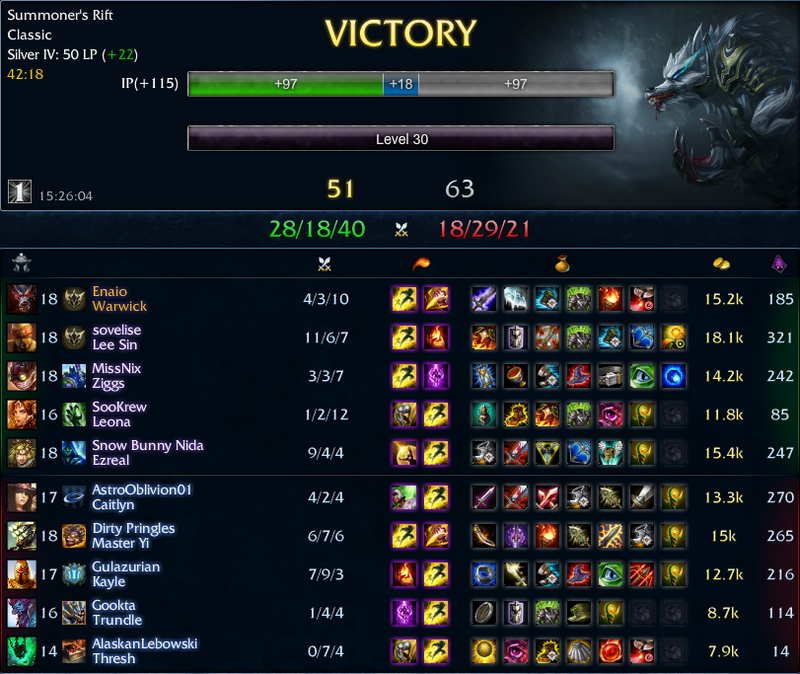 After that, I got a few kills on Tryndamere and was able to get my Feral Flare. Yes, I still went Feral Flare even though I was getting counter jungled a ton. I actually didn't get my wraiths until the 5th spawn. Was really worried about this game... and than we started team fighting. Every team fight, I ulted either LeBlanc or Ezreal and got an instant kill, then would chase after the other. My team did the rest. After I made the second target get away from the fight, I came back and would help them take down Udyr or Nautilus, because usually Tryndamere would be dead, but they really didn't need me. At the end of the game, I got a chance to 1v1 Tryndamere. Both of us were full health. He didn't do anything to my health bar. As he was about to die, he ulted and ran. I got my ult off while he was spinning, which was near the end of his ult. He died and then we pushed to win the game. Overall, this game was intense and a fun experience. Even though I can over come it... I would rather not face another double jungle again. Even though I miss the smite on the enemy blue this game, I was able to get the ganks off I needed to get my team rolling. 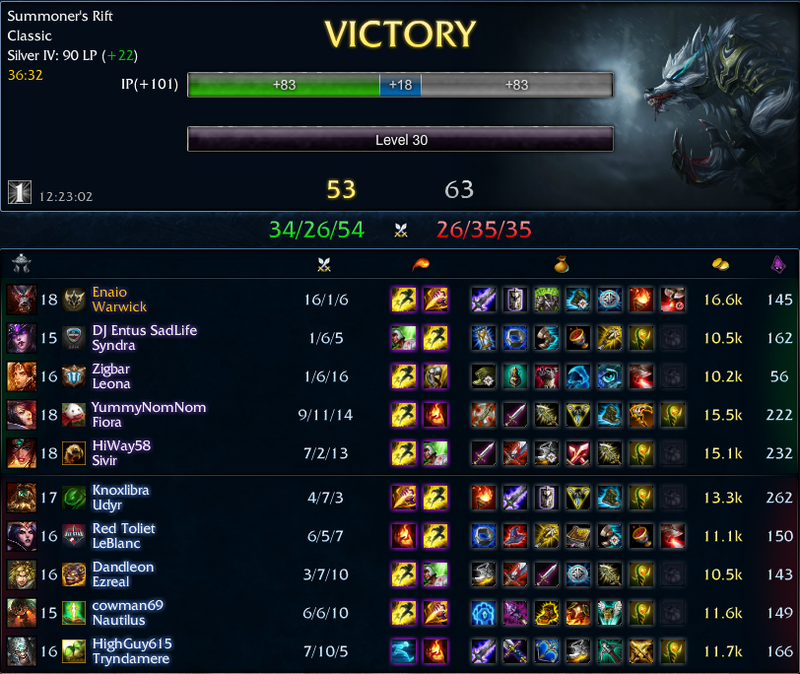 I actually chased down Renekton before level 6 after he killed Lee Sin. After that, I smited a wraith (don't know if it was the right one) from Jayce to hit level 6. This game wasn't really won by a solo person or two people, this game was won by the whole team. We all did well in our roles and performed better than our opponents. Overall, it was a good game. Haven't played Warwick jungle since the end of Season 2. Definitely happy I picked him this game. Was able to steal red from right under Yi's nose (literally, he smited to start the buff). After that, when I saw him ganking, I was stealing. After while, Yi was just a meat shield that had little health. Lee Sin was able to 1v1 him in top lane at 20 minutes. He didn't get Feral Flare until about 20 minutes, when I had mine at 15ish. I just farmed him out of the game. Overall, this game was won because I was able to keep Yi from getting anything until the end when he started to get the ability to clean up a kill or two after team fights, which got him killed in the end.